This classic of Christian devotional literature, with readings focused on the life of Christ, has brought understanding and comfort to millions for centuries. Written in a candid and conversational style, The Imitation of Christ discusses liberation from worldly inclinations, recollection as a preparation for prayer, the consolations of prayer, and the place of eucharistic communion in a devout life. 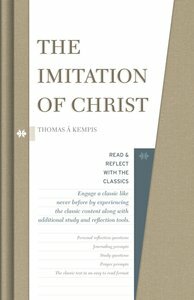 The Read & Reflect with the Classics edition of The Imitation of Christ includes the classic text in an easy to read adaption coupled with personal reflection questions, additional study questions, and prayer prompts for today's Christian reader. About "Rrc: The Imitation of Christ"